On Sale Now! 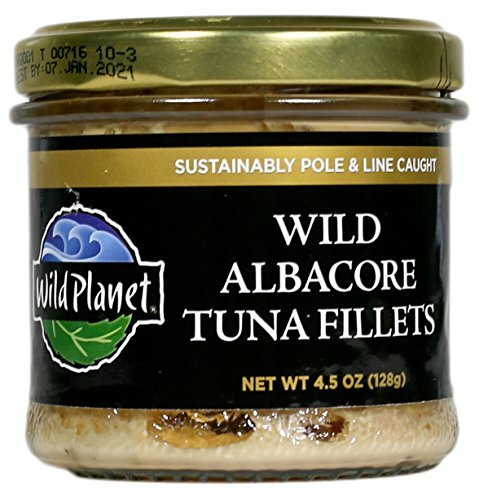 Save 8% on the Wild Planet, Wild Albacore Tuna Fillets, 4.5 Ounce Jar (Pack of 12) by Wild Planet at Smokey Robinson Foods. MPN: 55. Hurry! Limited time offer. Offer valid only while supplies last. Wild Planet is committed to providing the finest tasting sustainably caught seafood while supporting the conservation of wild marine ecosystems. Wild Planet is committed to providing the finest tasting sustainably caught seafood while supporting the conservation of wild marine ecosystems. Nothing compares to the flavor, nutrition and value offered by Wild Planet! The smaller fish we catch are lower in mercury; the firm texture and rich, clean taste of Wild Planet will be the perfect addition to all of your favorite recipes.